​This production of Alexandre Dumas’s famous tale (adapted for the stage by Catherine Bush) is a familiar story. D’Artagnan, an ambitious young fighter, comes from the country with dreams of joining the illustrious King’s Musketeers: Athos, Porthos, and Aramis. 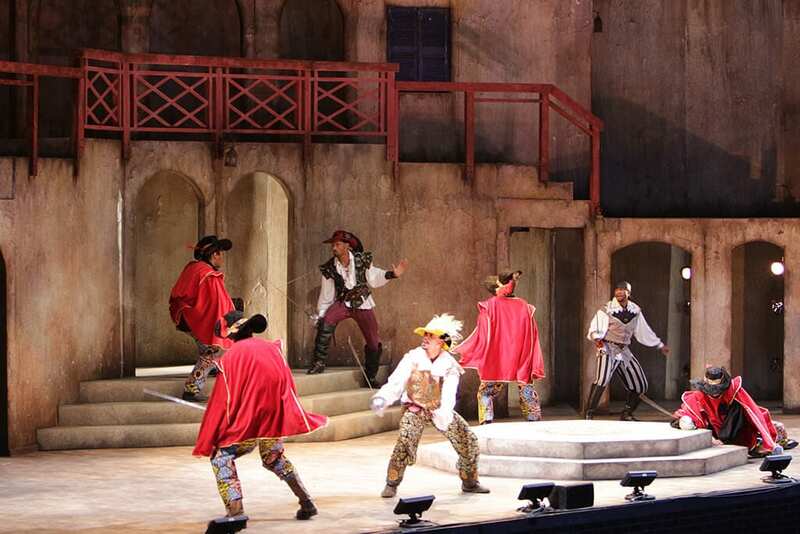 After the Three Musketeers test D’Artagnan’s character, as well as impeccable fighting prowess, our protagonist becomes one of them – only to be embroiled in an evil political scheme, with dangerous villains and a mastermind behind it all. 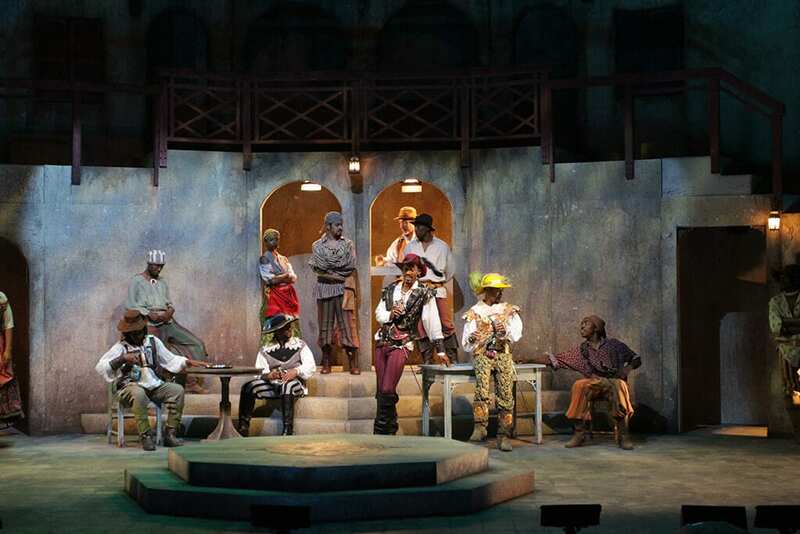 But the Classical Theatre of Harlem lovingly upgrades 17th-century France. The set of the amphitheatre is comprised of complex yet austere doorways, levels, and staircases. Against the colorless backdrop, the wonderfully mismatched patterns and vibrant colors infusing the otherwise-historical period costumes are all the more stunning. 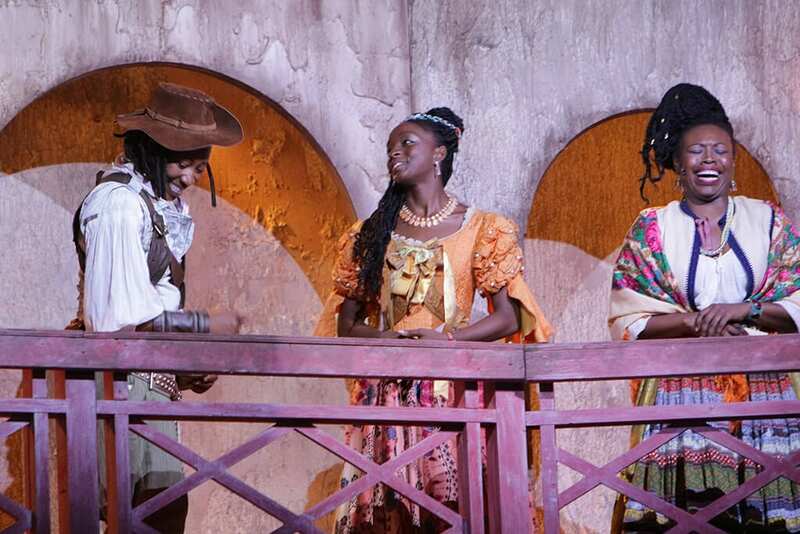 Intricate, beautiful, and unique, from the hooded cape of the Queen of France to the embroidered boots of Monsieur de Treville, the costumes are a nod to the Haitian roots of Alexandre Dumas, as well as to the diversity represented in the play and in the company itself. The best modernization, however, is in D’Artagnan herself. 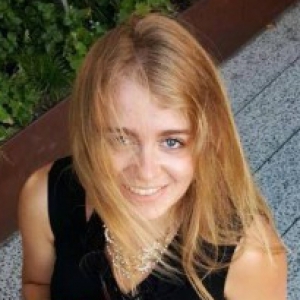 Yes, that’s right – d’Artagnan, played with charming moxie by Miriam Hyman, is a strong female lead. The dynamics twist in the best possible ways, adding entirely new angles to the story. D’Artagnan’s rise to prominence as a Musketeer is all the more impressive, but her relationship with Athos, Porthos, and Aramis isn’t tainted by misogyny; rather, it blossoms from mutual respect. D’Artagnan’s love for Constance, a friend of the Queen’s, offers a refreshing depiction of a queer relationship, as unburdened by stigma and taboo as would have been the romance of a male d’Artagnan. There is beauty in every element of this production. Jenny Bennett’s direction is heightened by the carefully choreographed scenes of dancing, fighting, flashbacks, and plotting. The costumes seem to become more and more stunning as the play goes on. 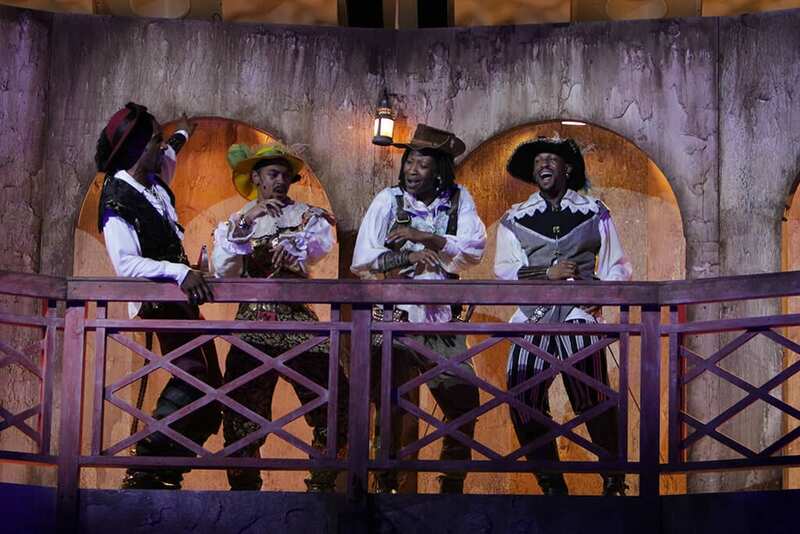 In the Musketeers (Emmanuel Brown, Brandon Carter, and Rey Piniella) lives the delightful fusion of modern swag and 17th-century chivalry that so characterizes this production, as much as their foes Rochefort (R.J. Foster) and Milady de Winter (Piera van de Wiel) represent its timeless mischief and adventure.